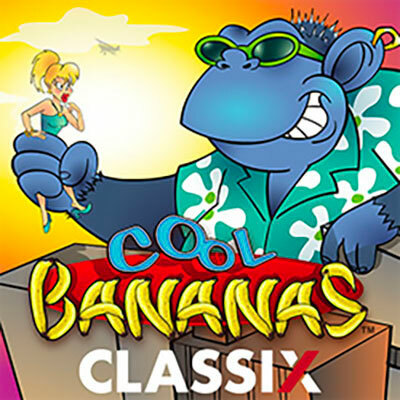 Cool Bananas is a wacky video slot game designed by WGS Technology which centers around a band of funky monkeys looking to score as many bananas as they can. What’s in it for the player? I hear you cry! Well all we can say is you’d have to be bananas not to try and win the huge prizes on offer in this slot. Other than random monkeys kicking back and relaxing, Cool Bananas can feel random at times without a specific central theme to anchor this slots’ presentation when the player first encounters it. However there is certainly a lot of original content here to enjoy if players stick around. Once known as Vegas Technology prior to the change in gambling regulations, WSG Technology now offers a range of 3-reel classics and 5-reel video slots in addition to a selection of more classic casino titles for those who fancy something more old school titles such as Red Dog, Baccarat and Craps. Following WGS Technology’s rather tumultuous history, it still manages to supply a variety of slots bound to captivate players across a large spectrum of tastes and interests. This slot’s game matrix features 5 spinning reels with enough space for 3 symbols on each by the end of the player’s turn. 25 paylines are also available during the game. The aim of the game is to try and make sure the winning symbol combinations line up and paylines to secure their cash value. The ‘bet max’ button is useful for those looking to raise the stakes in their next spin and grow their winnings. Cool Bananas features two different symbols groups. The first contains the more traditional card icons starting with number 9 right up the Ace. Players can get up to 150 times the value of their bet if they land a 5-Ace combination. The second group collects the more interesting and unique symbols including sunglasses, pie, cityscape and girl. These icons represent the larger, rare and more valuable prizes on offer. Prizes available can rocket up to 1,000 times the player’s wager should they land a 5 girl symbol combo on a payline. If the player is unlucky, there are also two special symbols that could turns things around. Firstly, the monkey symbol acts as a wild card so can therefore substitute for any other symbols in play. Players who employ it can score up to 5,000x their bets. The banana icon is a scatter that will guarantee a payout on any position. Similarly, free spins can also be won if using this symbol correctly. Each banana awards 8 free games for a maximum of 40 free spins including wins doubled. The tongue n cheek humour may put off some players who are looking for a more sophisticated slot but there is more than enough in terms of gameplay to warrant a look if you fancy some laid back slot spinning action.